Posted as part of Lens and Pen by Sally’s Phoneography and Non-SLR Digital Photo Challenge: Black and White. Fantastic light. That really why you’re drawn there. I don’t think it’s the gum. It looks about as old a town building as you guys might have, Lisa: is that the case ? Makr ’em ! – great idea !!! Love, love this in B&W, Lisa. I still shake my head every time you post a shot of the gum wall because I can’t believe I had never heard of it in all my visits to Seattle. Next time! It really is pretty gross, Sukie. 🙂 I look from a distance but plenty of people have no problem touching and adding their own gum. Eew! Thanks, I’m happy to hear you like it! When I saw the photo, I thought this was a small town in Europe some where. I hope to get to Seattle one day next year. Great photo! The light gives this kind of a creepy and menacing look. It’s not just the gum! Love the texture of the bricks and the pipes above. Lovely light – it looks as if it is a really old photo. 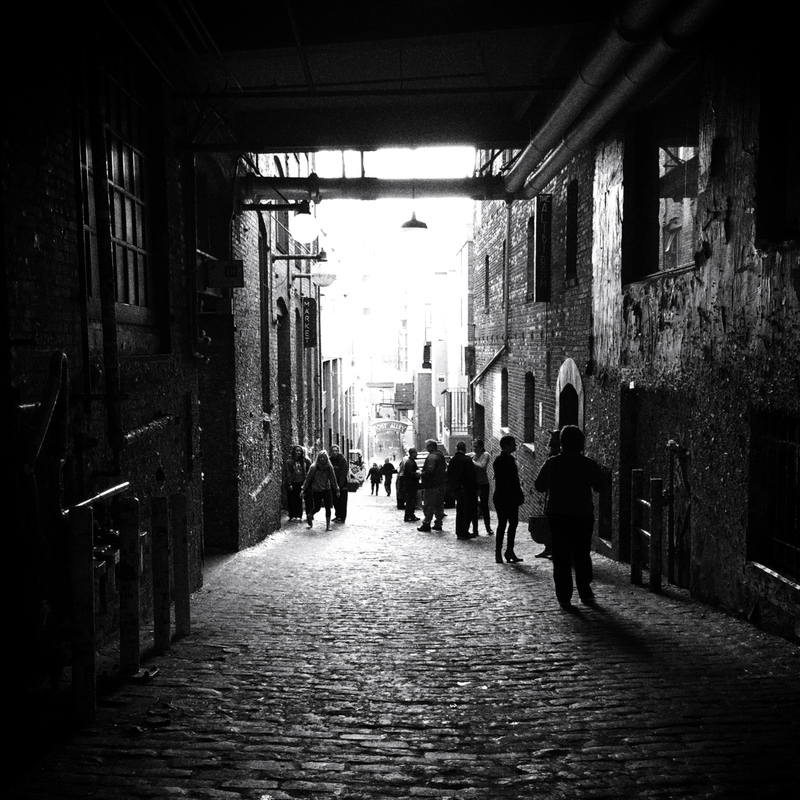 Great shots and I love the old cobble stone alleys in Seattle. Lisa, nicely captured urban setting. Alley ways are intriguing, especially with the way that you caught the light’s power to shed itself on everything in its reach. Happy Photo Challenge. This is a beautiful and classic photo! I’m in awe! Thanks, Amy coming from you this means a lot! I love the photos, but I’m with you as far as the gum goes. I’d prefer some great graffiti! Thanks, Carol. I’m happy to hear black and white suited the scene. Post Alley runs diagonally through the area, Kris and this section is on the south side below market level. There is a flight of stairs close to the bronze pig, Rachel that will take you down to the ghost tour meeting place and gum wall. I was perfectly happy staying in the middle of the alley, Sylvia but lots of people were right there, touching everything! Love the cobblestones. It gives the shot that European feel. Thanks, the stones are my favorite part of this alley. I like the shadows and the overall mood. It looks as if it was taken with a film camera. Great job! I love this take of the gum wall, with all of the contrast between light and shadow. That wall is really weirdly compelling.